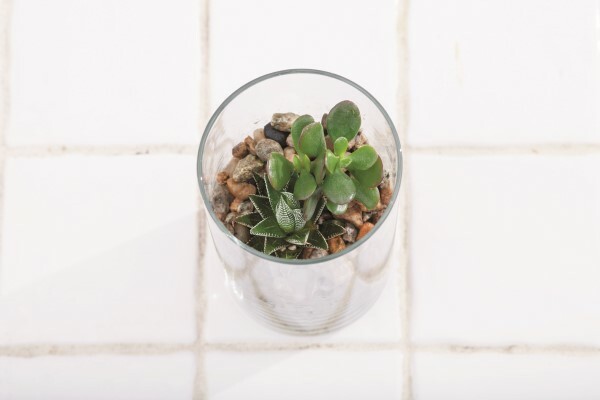 Terrariums are a great way to bring the joy of a garden indoors. These miniature worlds have a magic and charm all their own that you can customize to your own unique tastes. 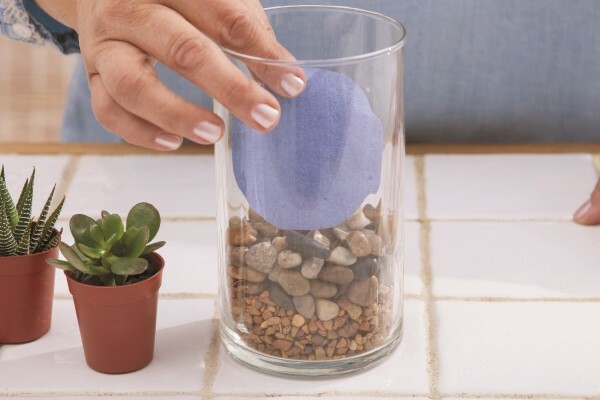 This pebble terrarium garden is an easy straight-forward design that can be manipulated into various assorted looks. 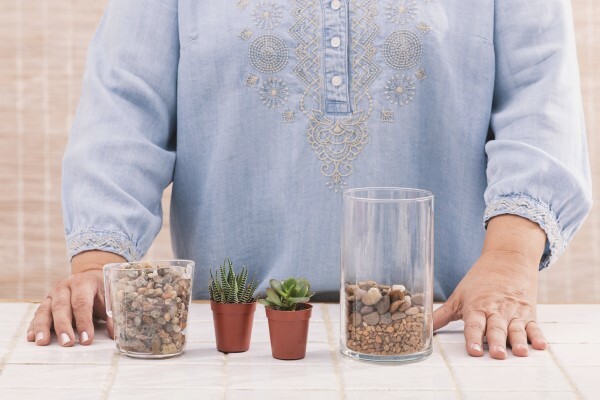 The colors of the stones can be changed, the succulents used can easily be varied, and the glass container can be taller or wider. 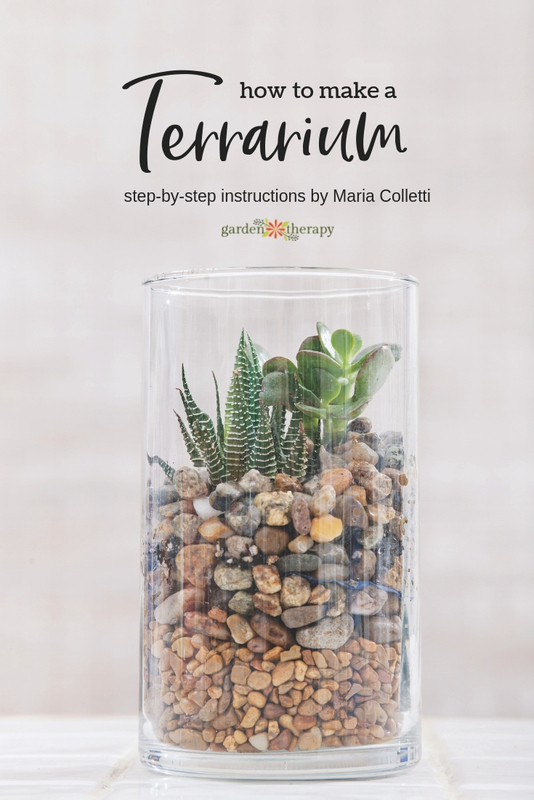 This step-by step tutorial comes to us from terrarium expert and author Maria Colletti. Once you have this basic design down, it gives the you the opportunity to interpret a terrarium garden many times over and with your own vision. 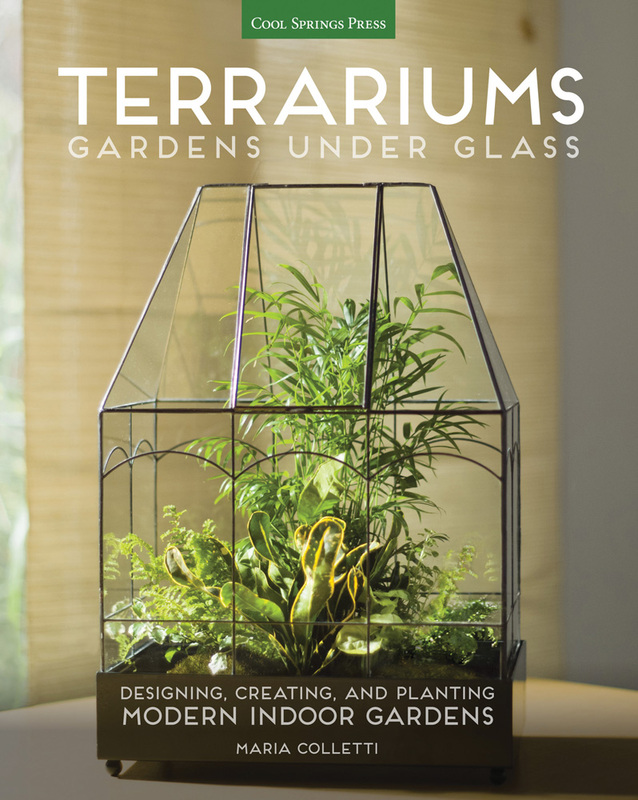 In my new book, Terrariums: Gardens Under Glass, I speak of plants and projects and glasshouses with what I would call ‘green love:’ the passionate emotion that goes along with creative works of art, whether that art be a symphony, painting, or a glasshouse of plants. Believing your craft is an artful creation elevates your project to a stunning natural beauty close at hand. So, each detail becomes important. Maintaining the plants within the container is easy. The best tool is a water mister set to stream shots of water into the plant’s roots, maybe a maximum of every 2 weeks. The trick is to make sure the roots are the ones receiving the water and not the pebbles. This detail sounds obvious but it is all about precision. Right spot, less water is better. Some succulents, such as Echeveria or Aeonium, are soft leafy plants. Even though they can tolerate extended periods of neglect, this may cause some bottom leaf drying. So, I watch my succulent wonders and work out the best watering routine. In your space, temperature, lighting, and dry air will vary, so it may take the first few weeks till you find the perfect moisture needs for your Pebble Display living décor. Let your ‘green love’ flourish and fall deeply for your new creation. I hope it brings you joy. This is a simple project that shows how to layer different size stones to enhance a small container. The glass also has vertical ridges that catch the light. I am very fond of this small tower of succulents and stone. It sits on my bookcase in an east-facing window where it can bathe in the morning sun. I use paper dividers to keep materials separate and distinct. This project does not need a divider between the aquarium gravel and the river stones to keep them separate, but I add one between the layers because soil will also be added around the rootball of our small Haworthia. The potting mix tends to slide through stone and will ruin a layered arrangement. 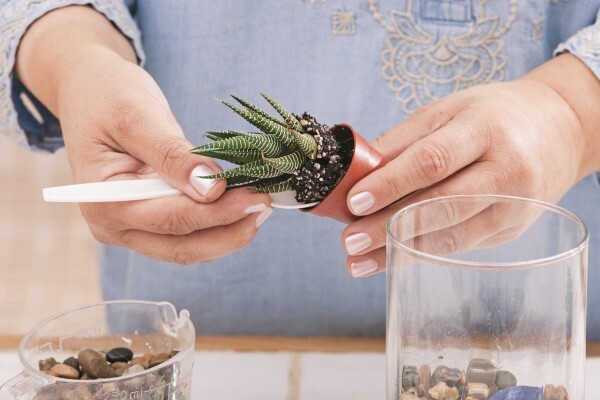 As I hold the tiny succulent near its destination in the glass cylinder, I use a plastic spoon to scoop out the plant and potting mix from its original plastic pot. 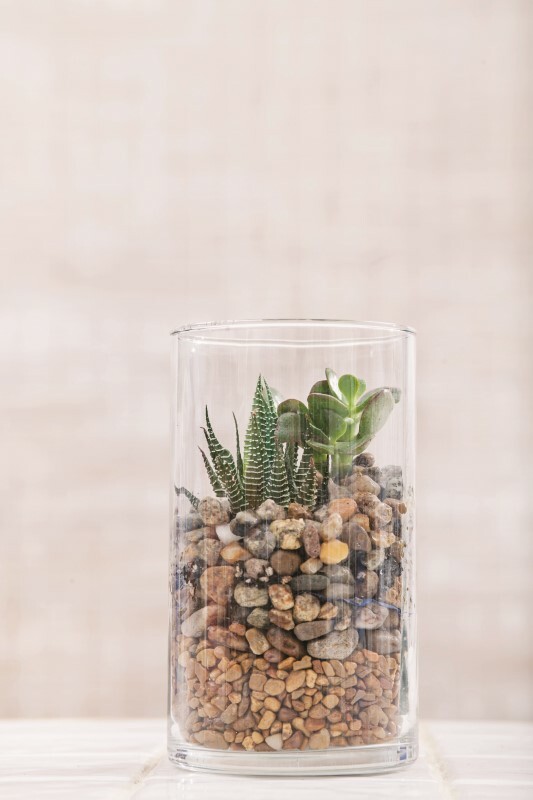 I want the plant’s rootball surrounded by soil in the glass cylinder so that soil will retain water to nourish the plants, even though the Haworthia and jade plant will be buried in stones at completion. I use a tool, the white plastic spoon, because the small rootball is falling apart and I need to get it into the narrow cylinder opening as quickly and as intact as possible. I anchor the roots in the soil as I tenderly hold the tip of the leaves, being very careful not to break them. I place a tiny jade plant behind the Haworthia, and I raise it up a bit on some stones so that it towers slightly above the other plant. The final step is to fill in around the plants with some pea gravel that has a slightly different but natural color. I use my hand, angled like a scoop, to direct the pebbles. Peering into the top to see the faces of the duo looking up, I adore them—their symmetry, their structure, their placement. I fall in love with my projects and don’t want to give them away. Mine, all mine! Reprinted with permission from Terrariums: Gardens Under Glass by Maria Colletti © 2015. Published by Cool Springs Press. Photography © Maria Colletti. 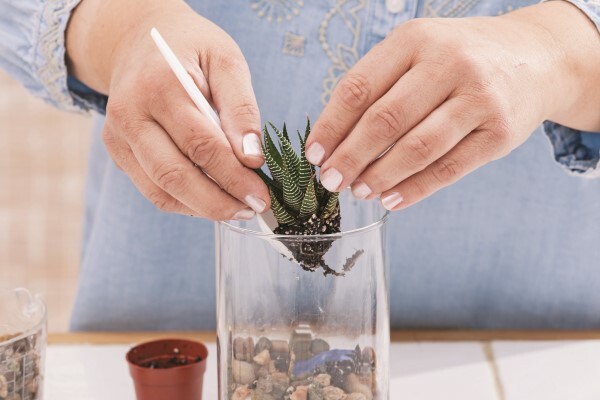 Maria Colletti, terrarium designer for Shop in the Garden at the New York Botanical Garden, is a terrarium purist (with a good dose of “why not!”). She adores the “humble” fish bowl, has found love in mood moss, and for a long winter admits an obsession with Cryptanthus. 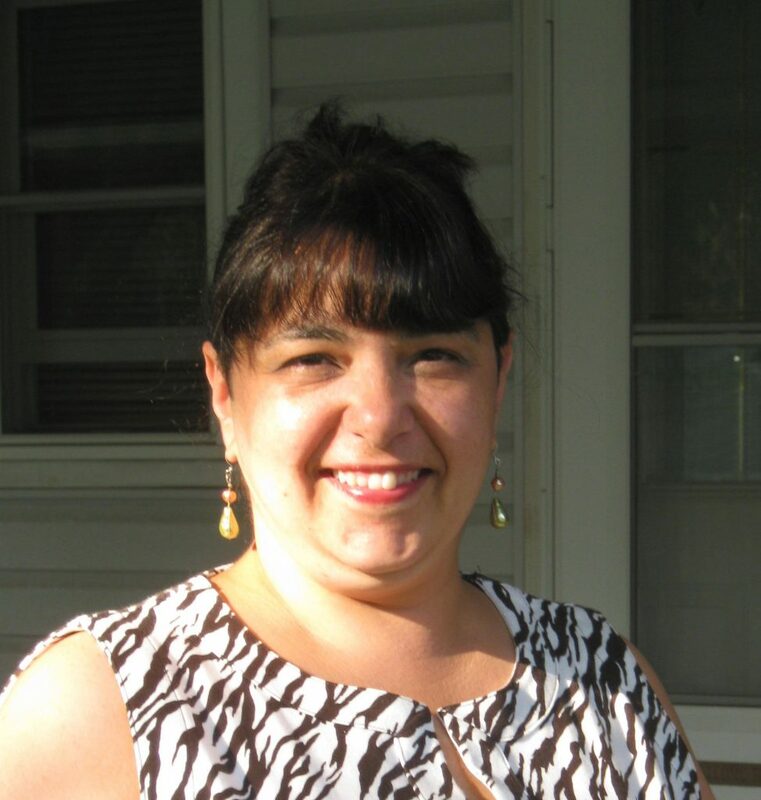 Maria is also the author of Terrariums – Gardens Under Glass: Designing, Creating, and Planting Modern Indoor Gardens where you can find ten step-by-step projects that represent the best of her work, advice, and sources for all things terrarium building alongside ideas for custom projects that require no more than a turn of the imagination. Wait until You See this Terrarium Nightlight! I love this so much! Thanks! This is such a neat & easy idea! I think these would make stunning centerpieces. Thanks for sharing with Merry Monday!